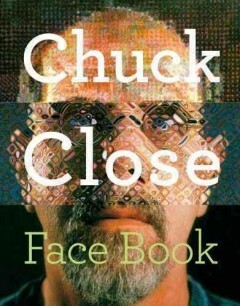 When I first heard about Chuck Close: Face Book I was a bit skeptical. I really liked Jan Greenberg's biography of the artist from 1998, Chuck Close, Up Close. Do we need another children's biography of Chuck Close? Once I opened Chuck Close: Face Book, my doubts immediately went away. This book is amazing! One major difference is that Chuck Close: Face Book is an autobiography; readers will learn about Close's experiences, obstacles and successes directly from the artist. The format of the book is unique. It's structured in a question and answer format, and each question comes directly from 5th grade students from PS 8 in Brooklyn. Twelve students from PS 8 had the opportunity to spend the day with Close in his art studio. The pages use grids and rectangles much like Close's art. A question is placed in one rectangle, a portrait is placed in another rectangle, and text is in a separate box. While answering the students' questions, Close reveals that he has dyslexia and prosopagnosia or "face blindness." He has trouble remembering facial details, so he doesn't usually recall people he has already met. Close made it through school because of his artistic talents and his parents who encouraged him to create art. He even went on to earn a graduate degree from Yale's School of Fine Arts. Much of the book explains why Close paints faces, and he describes the techniques he uses to create his art. Close's portraits are shown throughout book including a photo of Close standing beside a nine-foot high self portrait. The art is placed perfectly throughout the book so that readers gain a sense of the artist's work as he answers questions about his life. One question asks, "Why doesn't anyone in your art smile?" A black and white portrait of an older woman is placed on the page next to Close's answer; she isn't smiling. The portrait is made from oil fingerpainting, and the subject is a Holocaust survivor. The most appealing part of this book is in the middle. Fourteen self-portraits are grouped together. The self-portraits use a variety of media such as marker, ink, woodcut, pastel, oil and pulp paper. Each page is cut into thirds so that readers may flip through mixing and matching pieces from the different portraits to "make new combinations." I envision kids spending a great deal of time interacting with these pages. In 1988, Close suffered from a collapsed blood vessel in his spine which paralyzed him. He refers to this as "the event." Despite being confined to a wheelchair, Close continues to create art including over-sized portraits. A visual timeline of events from Close's life is located in the back of the book along with a glossary and list of art resources. Chuck Close's life story will inspire children and serve as a model those who have difficulty learning in traditional ways. This perfectly designed book will engage readers, and it's sure to win some awards along the way. I can't wait to put this book in the hands of the children in my library.